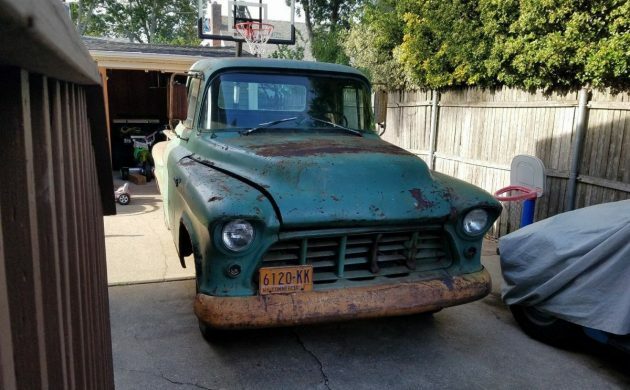 Time’s running out for this 1955 Chevy pickup listed on eBay with no reserve. 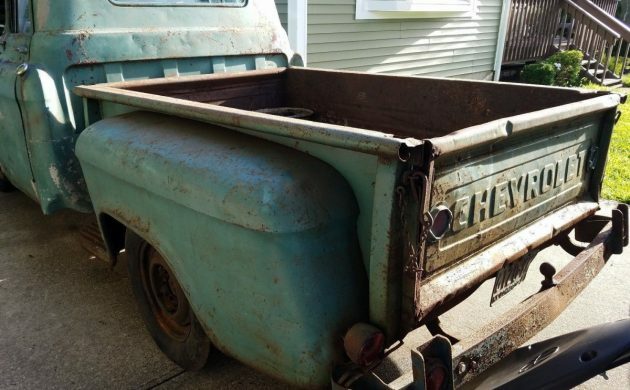 It’s a non-runner, but the seller claims it is a “very untouched” truck, owing to its stock configuration and patina’d body. 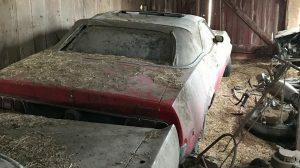 The truck was last registered in 1979 and the seller does not have much in the way of paperwork, but if you live in a no-title state, it shouldn’t pose a problem. Plus, with bidding currently well below $2K, surely it’s worth a look. Find it here on eBay with just under two days left. 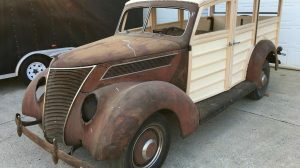 We recently listed an Exclusive for effectively the same truck; a 1955 model posted here as part of the collection from Georgia we’re helping to market (by the way, new pictures were added to the gallery if you were chewing on that one). This truck is slightly more tired and clearly not been a runner anytime recently. 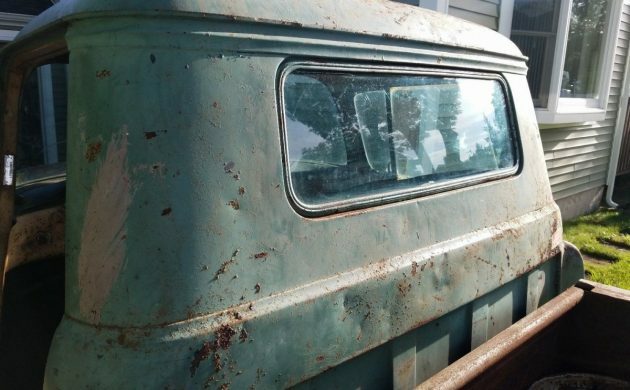 The seller promises it has surface rust only, no major rot in the body or the frame. 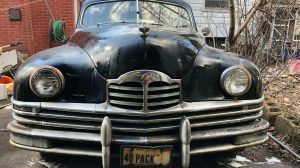 The seller offers few details, but while the body is dinged, dented and devoid of consistent paint, it’s hard to deny the aged look holds great appeal. Coupled with what looks to be a solid bed, good glass and no major rot in the cab corners, there’s a chance of finding a good foundation underneath the grime. But there does appear to be some rust present, including a hole in the passenger-side step into the cabin, that could stand to be better documented. 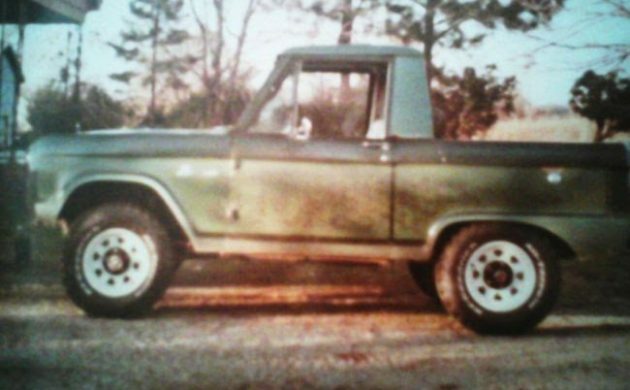 Three on the tree, a straight six and no word on whether it’s original to the truck. The engine won’t run and the seller doesn’t elaborate as to whether it goes into gear or if the mill still turns. 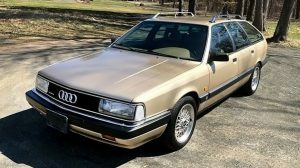 I suppose this is a case of the “no reserve” pricing giving the seller the attitude that cheap cars shouldn’t require tons of documentation, and I don’t entirely disagree with him if that’s the case – especially in the case of a no-frills workhorse like this. What do you think it will sell for? Jeff, Nice write-up for an interesting truck. I love your sentence with “…dinged, dented and devoid.” Great use of alliteration. Truck is located in Massapequa NY! I have many fond memories of Massapequa. One of my first jobs was working for a very small used car dealership located on Sunrise Highway in Massapequa, just outside of Brooklyn, for a classic shady character who went by the name of Slippery Jack, owner, chief negotiator and head salesman. His motto, when anyone returned with a complaint and after he’d chased them away, was: “If they want an education, they should go to college, I don’t sell educations, I sell cars”. The truth was that anyone who bought a car from Slippery Jack ended up getting a bit of an education too. My job was mostly stripping cars out behind the garage, I have no idea where they came from and knew better than to ask. That was sometime early or mid 1960s. Last time I was in touch with Jack was around 1971 or so, his wife was serving time for embezzlement and jack was trying to sell everything he had so the two of them could run off to South America when she was out on parole. Anyone ever hear of him? What the heck is a no-title State? Bill of Sale will get you a State Title. Example: NY didn’t require a title for a vehicle until 1973. Anything older can be sold & registered with nothing more than an old reggie or a notarized bill of sale. Pink slip’s Butch…and nice old truck. 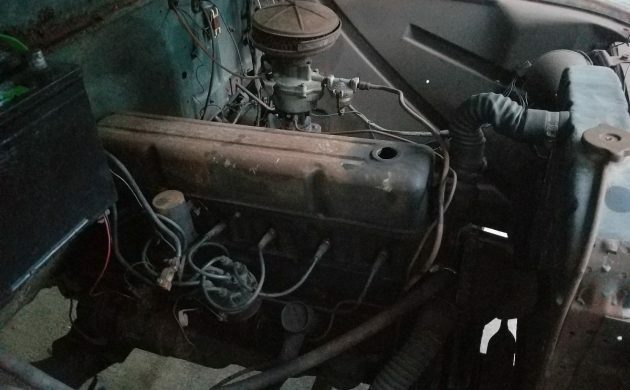 My bro’s had his – like it – big window since 1974…first V/8 swap we did when the tired 6 ran out of stuffing. and inspiring them to open a great homeless shelter. Those cab corners have new metal on them…and poorly done. The driver’s side goes halfway up the corner! I see rot-thru on the passenger step, too. These are typical spots for rust on this truck, so I would expect more in the vent system and cab floor. No pics of the truck bed, either. At least the front fenders above the headlights look solid. 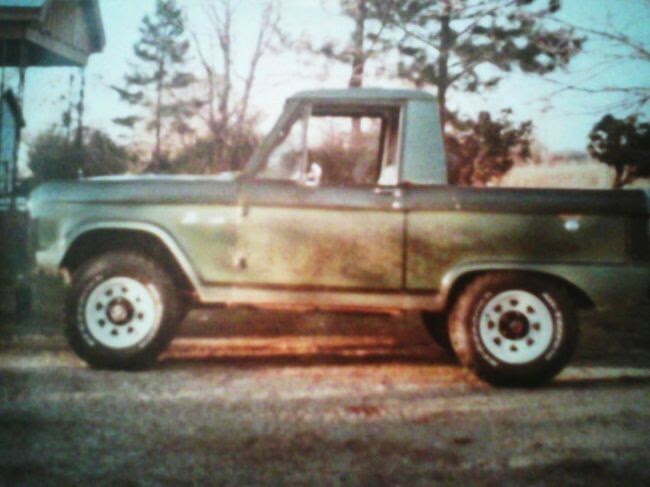 In 1979 i traded one these 55 chevy’ for a ’66 half cab lol.